The Traveling Tripod: If you photograph motorcycles, then why aren't you in Daytona Beach? If you photograph motorcycles, then why aren't you in Daytona Beach? If your passions include travel, photography and motorcycles, then you should be in Daytona Beach, FL....right now. 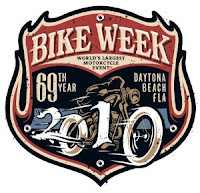 Today marks the opening of Bike Week 2010. With a crowd of 500,000 motorcycle enthusiasts, chances are pretty good you'll find some kindred photographers shooting all the action. To see the rest of the article and a slide show, click here.